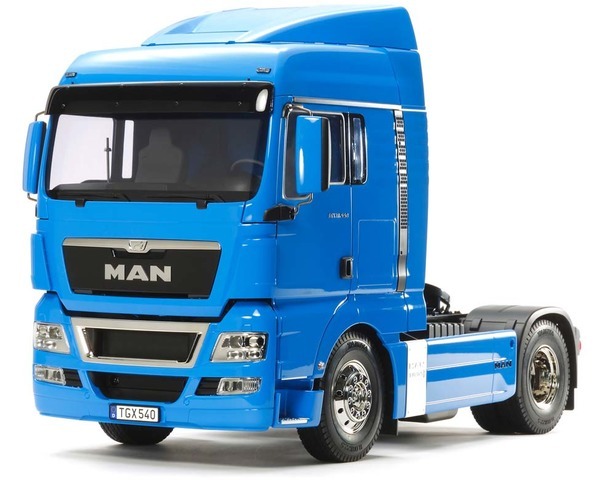 This is a special edition of the 1/14 R/C MAN TGX 18.540 4x2 XLX assembly kit. It comes with body components, which are beautifully pre-painted in Tamiya TS-10 French Blue (clear topcoat applied), with a durable coating applied to protect the paintwork from damage. The Tamiya rendition of the MAN TGX 18.540 4x2 XLX faithfully captures the truck's modern form with the use of ABS plastic body parts and a number of metal chassis components. One look at the detailed interior and auxiliary equipment, such as air tanks, will confirm that the body features replica-quality realism, which is further enhanced with metal transfers depicting emblems and numerous metal-plated parts. The chassis is built for durability as it uses aluminum side channels with resin cross members. Drivability is accomplished by power from the front-mounted motor and is transmitted via a propeller shaft to the rear axle; built-in differential gears guarantee smooth cornering. Gear changes can be made via a separately sold 4-channel transmitter. The model features a highly detailed body and a 2-axle chassis with durable ladder frame. When controlled with a separately available R/C system, the 3-speed transmission enables authentic gear changes while driving.